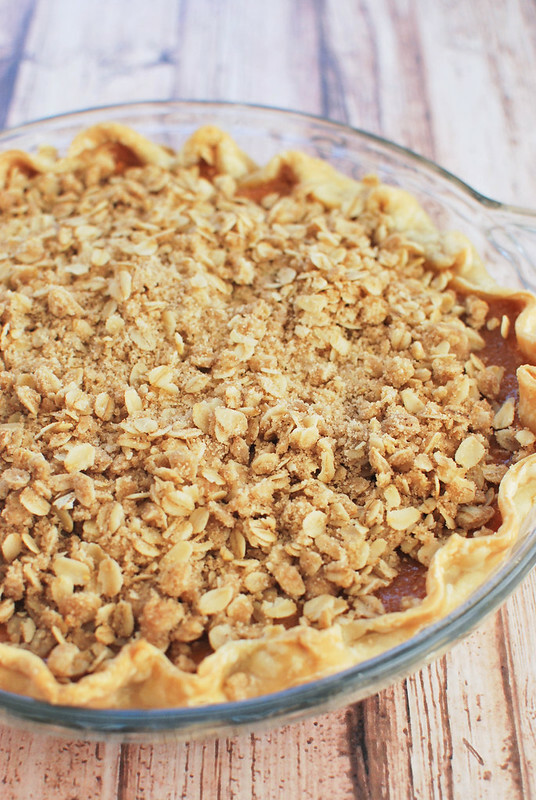 There are few things in life that I love more than a pie with a streusel topping made of rolled oats. I feel like I mention at least once a week that I really, really hate making pie. The crust. It’s just too fussy for me. And then there are those stressful moments where I’m positioned in front of the oven trying to catch it between when it’s undercooked and too jiggly and overcooked with burnt crust. Pie is just too stressful for me. But pie is SO GOOD and you can’t do the holidays without it, right? Plus that list of pies my husband wants gets longer everyday. I picked up the special winter packaging of Quaker Oats Old Fashioned Oats that’s exclusive to Target (it’s limited edition so keep an eye out!) and wanted to make a fabulous and easy pie with them. I’m super traditional when it comes to pie for the holidays. I like pecan, pumpkin, and sweet potato. That’s it. So I made a super simple, but absolutely delicious sweet potato pie. The pie starts with a store-bought crust and I don’t care what anyone says, I think they’re just as good as anything I’d make from scratch. Then a simple sweet potato mixture (I just diced my sweet potatoes and boiled them like I was making mashed potatoes – beat them with my stand mixer until they were smooth and added the rest of the ingredients) and then topped with the oat mixture. It turned out perfectly. Super soft filling with a crunchy topping. Just how I like my pie! 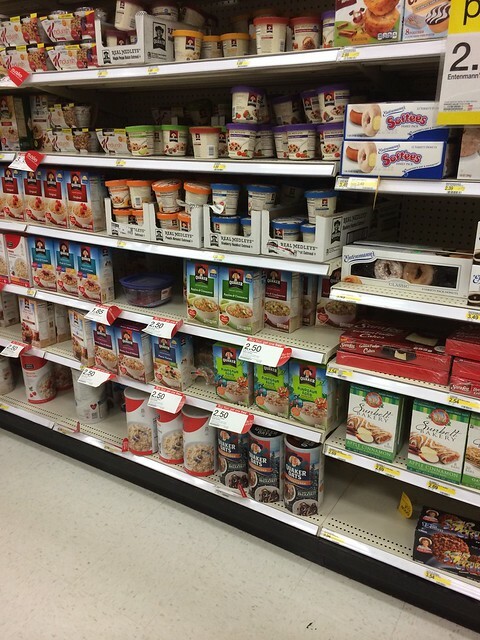 Make sure you print the Quaker Oats coupons on the Target website and then head to Target to #QuakerUp with the limited edition winter packaging of Quaker Oats and let me know what you think of #MyOatsCreation. Roll out pie dough and fit in pie plate. Trim dough, leaving a 1 inch overhang. Fold overhang under and crimp dough. Whisk together brown sugar, flour, cinnamon, and salt. Whisk in milk, eggs, egg yolk, and vanilla. Melt the butter; cook until the butter foams and continue cooking until the foam subsides and the butter begins to brown. Pour the brown butter into the pie mixture and then whisk in pureed sweet potatoes. Pour mixture into the pie crust. Place the pie plate on a rimmed baking sheet. Bake 30 minutes. 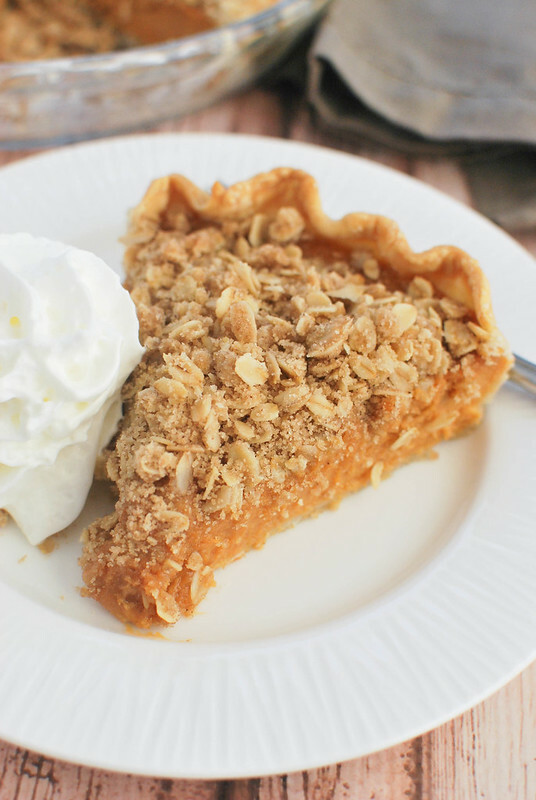 While the pie is baking, make the streusel by mixing together the Quaker Old-Fashioned Oats, brown sugar, cinnamon, salt, and butter. After the pie bakes for 30 minutes, remove from over and sprinkle the streusel over the top. Bake for another 20 minutes or until the pie is set and the streusel is golden brown. Cool before slicing and serving. 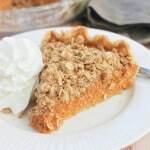 14 Responses to "Streusel-Topped Sweet Potato Pie (with Whole Grain Oats)"
So I’ve never had Sweet Potato Pie. Just Pumpkin. I love sweet potatoes with brown sugar and marshmallows, though. I gotta try this pie! I’ve made 2 sweet potato pies recently and am just in love! This streusel topping looks amazing though! I must try that next time. 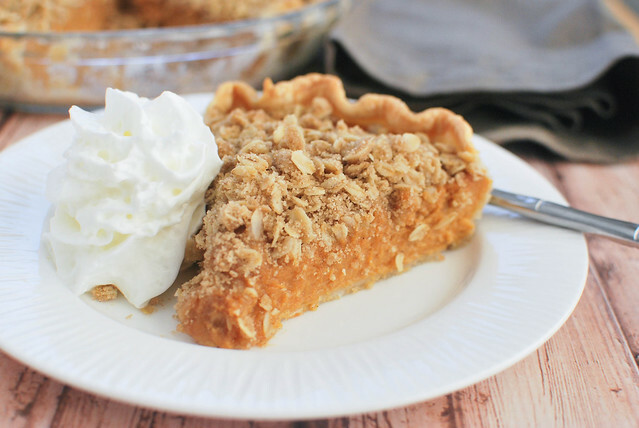 This pie looks really good and I love the topping! I’ve never had a streusel topping on a pie, but I have to give it a try. I can see how it would pair well with this sweet potato pie. I’m not sure if I can get away with it for a holiday dessert, but I’m going to try. My family is all about traditional pies. Party poopers anyway! Oh this pie looks seriously insane!!! I want a slice now! That topping!!! I have been known to eat just the streusel topping, great recipe, makes me hungry! 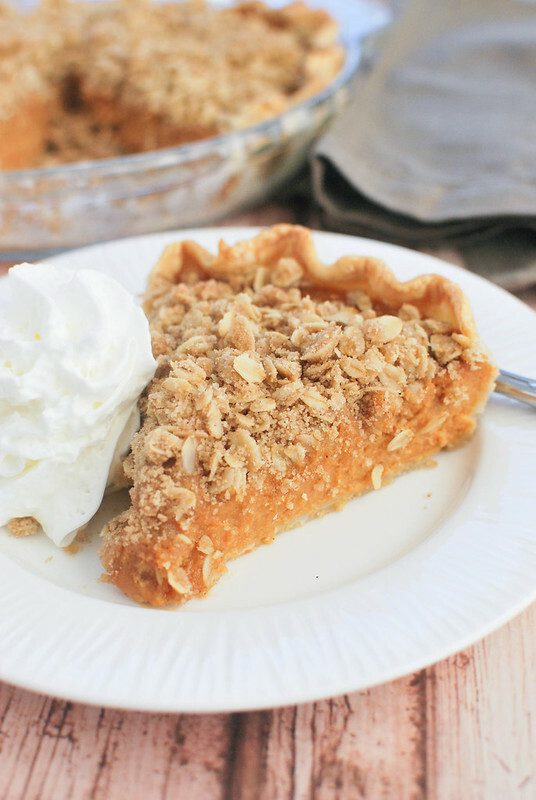 I love the streusel on top of this pie, looks so delicious!!! That streusel! That filling! Hello, perfect fall pie! how have I done a year (almost) of pies and not make sweet potato pie?!!? yum!!!! !